Mount Kenya is the second highest peak in Africa and is located around 320km away in the south of Mount Kilimanjaro. It is visible on a clear day. El Mundo Safaris provides a 5 days Mount Kenya trek package that takes you along the Sirimon- Naro Moru Route. Sirimon-Naro Moru route is one of the finest ways to access Mount Kenya. This route offers some of the spectacular views of the mountain peaks to indulge in. You will ascend your journey along the Sirimon track and descend through the Naro Moru track. No doubt, it’s a great trek to experience the majestic Mount Kenya in the best way as possible. Depart from Nairobi after breakfast and head towards Mount Kenya where our guide and porters will meet you. Drive along the Sirimon Park gate to check in the park and start your 3 hours long hike along the equatorial forest. Rest in the Old Moses hut for overnight (around 3,300m) and have your packed lunch served en-route. Take your breakfast in the morning and hike through Sirimon track along the Likii North Valley to get beautiful views of Sendeyo and Teleki. Proceed along the Mackinders Valley and your overnight will be at Shiptons Hut on a full board basis. Today is an acclimatization day. Head along the Hausberg col (4700m) and descend to Hausberg Valley and Oblong tarns before making a steep ascent further. Cross huge boulders through Two Tarn along the way to Mackinder’s camp (4,300m), located along the Naromoru route. Start your journey in the dawn to reach the summit and see the clear view of the magnificent scenery after sunrise. 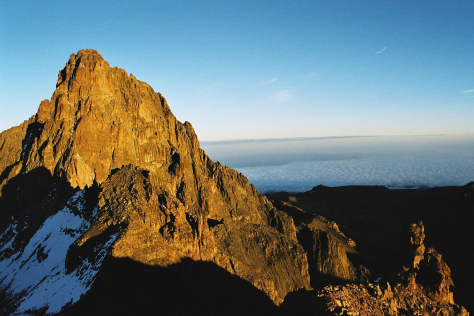 Our guide will help you reach the third highest peak – Point Lenana, 4985m. You will descend down the Teleki Lodge for breakfast and changing. In the afternoon, proceed down through the Moorland zone with beautiful view of Aberdare ranges and agricultural farms. Take your dinner and overnight at Met. Station Hut. Take your breakfast in the morning and hike down through the forest to reach the Naromoru Park gate. Just get in our vehicle and we will transfer you back to Nairobi to catch flight in the late afternoon. Book our Mount Kenya Hike Trek 5 Days today to enjoy the most out of Mount Kenya!